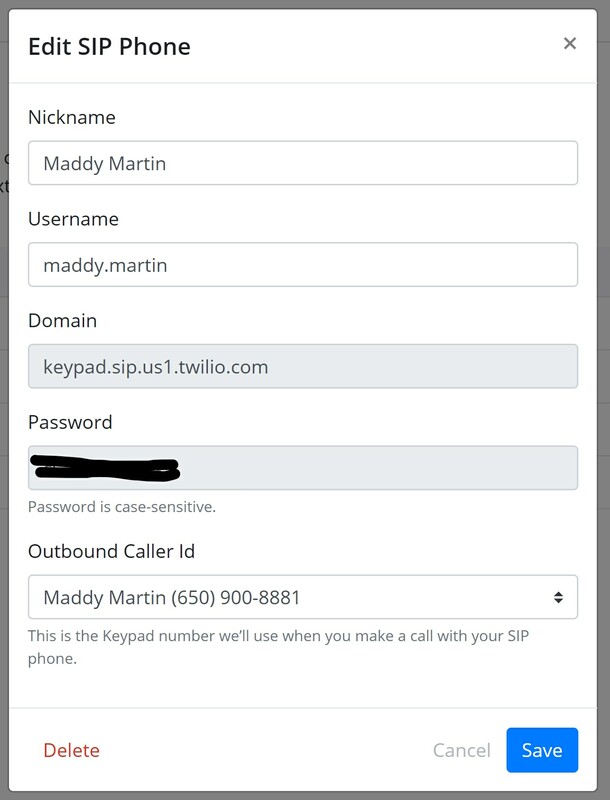 Now, Keypad works with SIP, so you can make and receive calls using a VOIP desk phone, your computer (via a SIP softphone app), or both. This feature is available for $5 per SIP-enabled number. Keep in mind that SIP is only for phone calls. For text messaging, voicemails, contact management, faxes, call recording, and other features of Keypad, you will still need to access the Keypad app through a web browser at https://app.smith.ai/keypad. Read on for directions to set up SIP calling with Keypad. Before you begin, please note that there will be an immediate charge to your Keypad account of $5 for each SIP phone you add. Go to your Keypad Office Directory at https://app.smith.ai/keypad/directory. 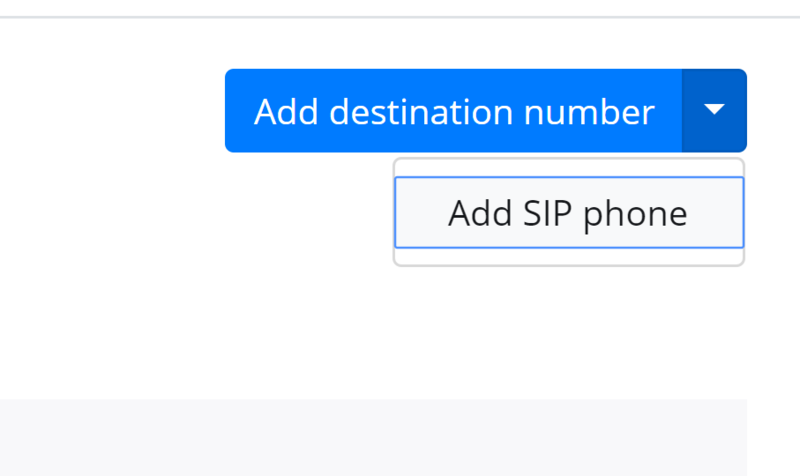 Click on the down arrow next to "Add destination number" and select "Add SIP phone." Choose a nickname and username (this is required for SIP authentication later), and the Keypad number that will display as your Caller ID. Note: You cannot change your SIP domain or password. Click "Save" to return to your Office Directory, where you will now see that your SIP phone has been added. Repeat steps 1 through 4 to add more SIP phones as needed. Download your preferred SIP softphone, like X-Lite (free, for any device), Telephone (free, but for Mac computers only) or Bria (a paid version with more features, for any device). If you're using Bria or X-Lite, open the softphone app, and enter your username (this may appear as "user ID"), domain, and password exactly as they appear in the Keypad Office Directory. Enter whatever you like for the display name. For the authorization name, enter your username or leave it blank. Save your account credentials. 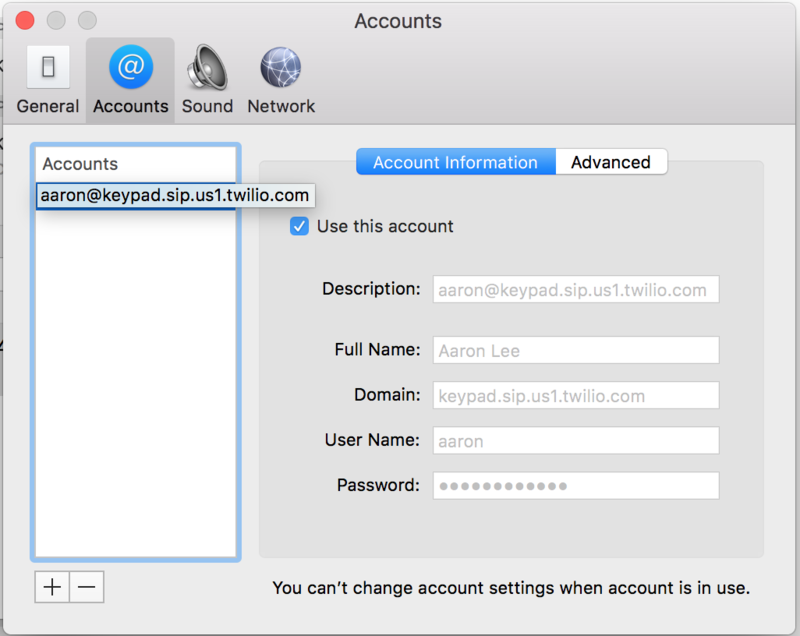 If you're using Telephone, open the Mac app, and click on "+" to add a new account. Enter your full name, domain, username, and password exactly as they appear in the Keypad Office Directory. The "description" is your username @ the domain (see screenshot below). Save your account credentials. 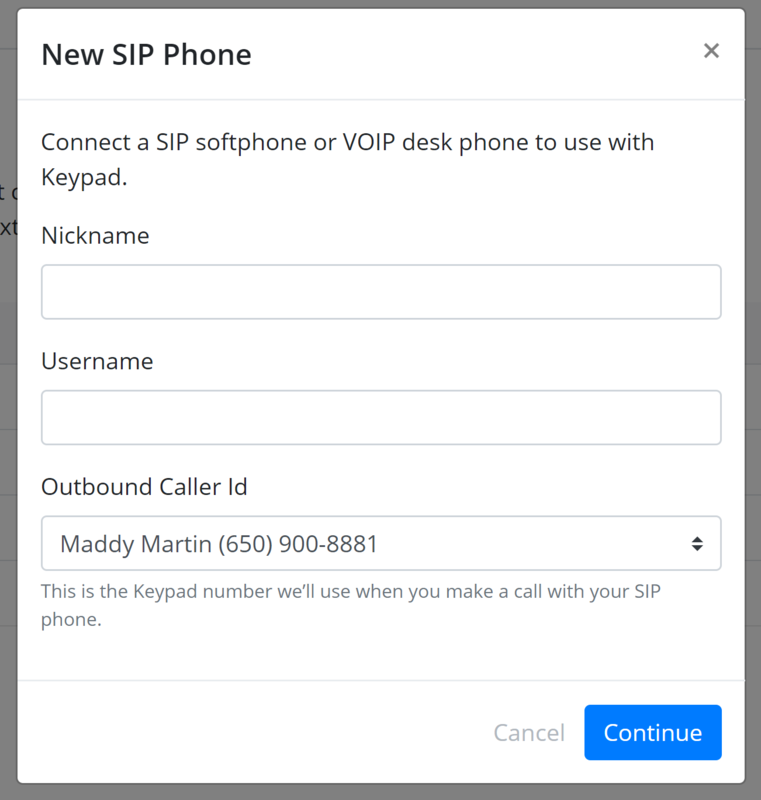 You can now make and receive calls on your computer or chosen device using your SIP softphone! 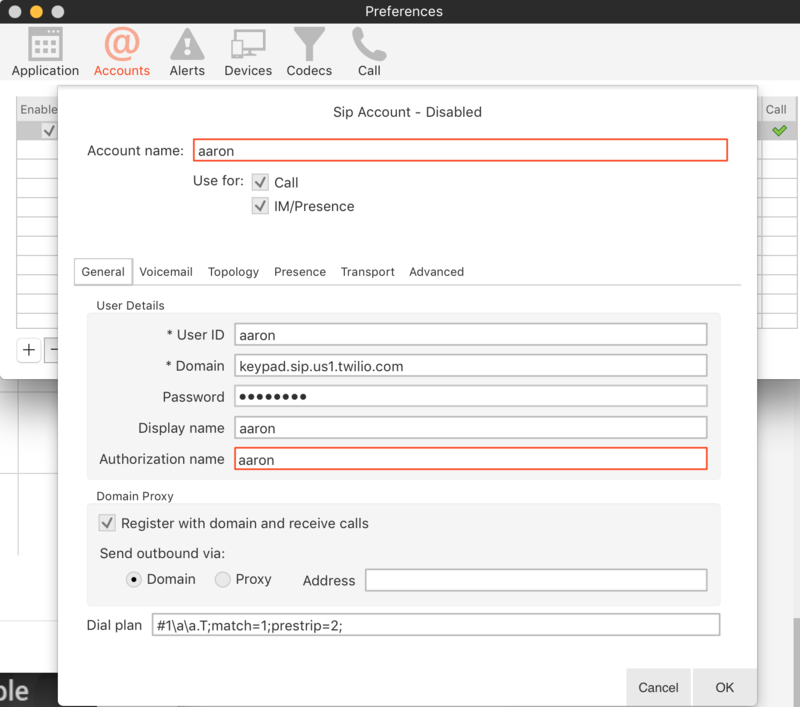 Don't forget to add your new SIP phone to your call routing configuration. Follow steps 1 through 4 above to add a new SIP number to your Keypad account. The process for setting up Keypad with a VOIP desk phone differs based on the make and model of your phone. Please also see our general directions for setting up Keypad SIP calling with Polycom VOIP desk phones, which include screenshots. Note: If you are waiting for new VOIP phones to arrive or for existing VOIP phones to be professionally reconfigured, you can use a free SIP softphone app like X-Lite in the meantime. We're here to help! Please contact us at keypad@smith.ai for assistance with SIP setup or configuration.